From time to time we become mildly wonkish and write about the implications of some of our data, including information that we did not include in A Review of Fifty Public University Honors Programs. Recently, we have been looking at correlations between faculty reputation and honors curricula on the one hand, and the attainment of prestigious scholarships, such as Rhodes, Truman, Goldwater, Fulbright, and National Science Foundation (NSF) graduate research grants on the other. A significant correlation that stands out is that between faculty reputation and prestigious NSF grants, awarded for research in science, technology, engineering, and mathematics, and, to a lesser extent, research in the social sciences. We did not find that our data for honors curricula correlated significantly with the attainment of NSF grants. This does not mean, however, that participation in honors programs is not important to STEM majors, for honors programs are the surest way to connect serious undergraduates with research opportunities supervised by high-quality faculty. In addition, of course, honors curricula typically provide more scope and depth to the overall education of all honors students. We also found a lesser but still significant correlation between faculty reputation and the attainment of Fulbright Student awards, given in a variety of disciplines. Again, the correlation of these awards with curricula was minimal; but the same access to strong faculty mentors via involvement in honors, along with the broader honors education, still points to advantages in pursuing honors. The impact of honors curricula is clear, however, when it comes to Truman and Goldwater awards, and when curricula are correlated with a metric that combines all prestigious scholarships (including Rhodes, Marshall, Gates, and Udall) except for NSF grants. Honors curricula are a stronger factor than faculty reputation with respect to the combined scholars metric, but both curricula and reputation are important. It is interesting that curricula correlate with the undergraduate Goldwater awards, also given for STEM research, but not with the NSF grants. The impact of faculty reputation was minimal when correlated to Truman Scholarships. So what is the “take home” message from all this number-crunching? For STEM majors, strong faculty along with honors research opportunities are probably as important as the general honors curriculum. 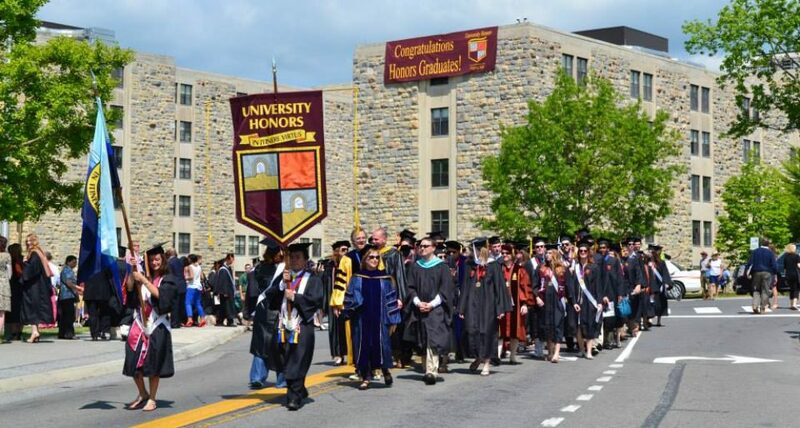 Departmental honors, with a thesis requirement, are also important if the honors program does not require a thesis. This entry was posted in Honors Curriculum, Honors Research, Prestigious Scholarships, Stats and Surveys and tagged honors curriculum and research, NSF awards and faculty reputation, STEM majors and importance of strong faculty, STEM majors and public honors programs by Honorsadmin. Bookmark the permalink.